Day 2 of the three-day draft is on today. You can follow all the goings-on right here. Round 3 - 91st overall. 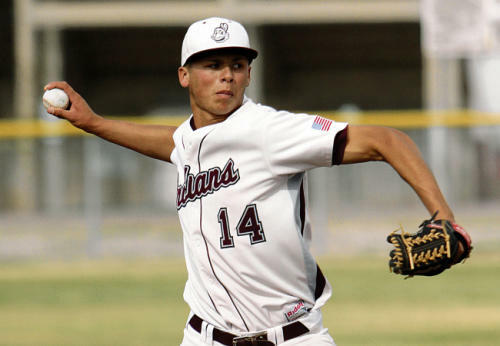 RHP Justin Maese, Ysleta, Texas HS. 6-3, 190. Born October 24, 1996. One of the biggest pop-up guys this spring, Maese sent scouts scurrying to El Paso amid reports that he was hitting 96 mph with his fastball and 86 mph with his slider. While he only flashes that type of stuff rather than maintains it, it's possible that he could sneak into the top three rounds. Though Maese's fastball can climb into the mid-90s, he doesn't tend to hold that velocity and often works at 88-92 mph. His slider has its moments too but he throws it too much and it often devolves into a less powerful pitch with slurvy break. Also a star quarterback for Ysleta High, Maese has the athleticism and frame to remain a starter. To do so, the Texas Tech recruit will have to become more consistent with his fastball and slider, develop a changeup and improve his control and command. Click here for video. More video right here. Round 4 - 122nd overall. 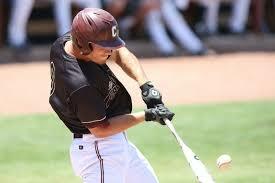 3B Carl Wise, College of Charleston (SC). 6-1, 215. Bats Right. Born May 25, 1994. Lightly recruited out of high school, Wise has established himself as one of the most reliable power hitters in college baseball. He homered six times in seven games in March and has reached double figures in two of his three seasons at Charleston. Facing top competition in the Cape Cod League last summer, he tied for second with six longballs. Wise has good strength and excels at generating backspin on his drives from the right side of the plate. He can get pull-conscious at times but generally stays under control at the plate and manages the strike zone reasonable well, so he should hit for a decent average. Wise has enough arm strength for third base but almost certainly will move to a different position in pro ball. His throws lack accuracy at times and his hands and quickness are subpar for the hot corner. First base is his likely destination. Video right here. Round 5 - 152nd overall. RHP Jose Espada, Puerto Rico HS. 6-0, 170. Born on February 22, 1997. Round 6 - 182nd overall. SS JC Cardenas. Barry University (FL). 6-0, 185. June 27, 1994. Round 7 - 212nd overall. LHP Travis Bergen, Kennesaw State (GA). 6-1, 205. Born on October 8, 1993. When Kennesaw State became the first NCAA Division I team in 21 years to win a regional tournament in its playoff debut last June, Bergen was named Most Outstanding Player after picking up two victories in the four days. He followed up with a strong summer in the Cape Cod League and has performed well again this spring. Bergen can hit 94 mph with his fastball, but he usually pitches at 88-92 mph. He lacks downhill plane because he's 6 feet tall and leaves his heater up in the strike zone more than he should, but it's effective because his extreme crossfire delivery produces run and sink and allows him to get inside against righties. Bergen's breaking ball varies between a fringy slider in the lower 80s and a promising cutter in the upper 80s, and he may want to focus on the cutter in pro ball. His changeup has some sink and is an effective third pitch. He throws enough strikes to remain a starter, though his lack of a true plus pitch gives him little margin for error. Click here for video. Round 8 - 242nd selection. LHP Daniel Young, University of Florida. 6-2, 195. Born May 27, 1994. Round 9 - 272nd selection. 3B Connor Panas. Canisius College, NY. 6-0, 218. Bats Left. Born February 11, 1993 in Etobicoke, Ontario. 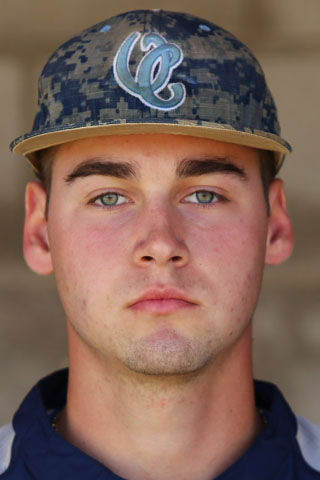 Round 10 - 302nd selection.C Owen Spiwak, Odessa College (Texas). 6-2, 185. Bats Left. Born May 23, 1995 in Mississauga, Ontario. For a list of the Blue Jays draft picks, click here. Posted by #2JBrumfield on Tuesday, June 09 2015 @ 01:12 PM EDT. Maese has been clocked as high as 96 miles per hour with his fastball and has consistently thrown in the high 80s and low 90s. He also has a terrific slider. Looks like a classic "Jays pick". I get the sense that we are going to either punt position players altogether (largely at least), or get them primarily from the IFA pool. I'm starting to love AA's drafting. 96mph in high school with a good slider already? projectable frame and athleticism? giddyup. Carl Wise is the 4th round pick. Orimoloye went one spot ahead to the Brewers. Wise has proven to be an RBI machine for the Cougars this season. His 52 RBIs are nearly double that of Brandon Glazer's 30, which ranks second on the team. Hitting .293 for the season, Wise's batting average jumps to .382 with runners in scoring position. He has 22 RBIs in 25 opportunities with a runner on third and less than two outs. 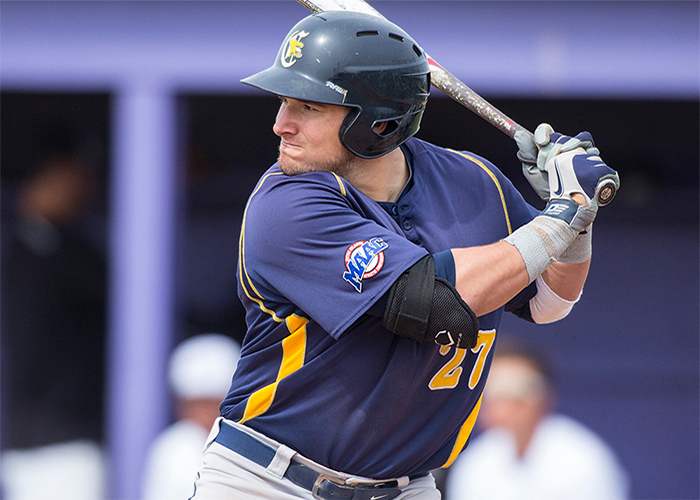 Wise's nine sacrifice flies led the CAA and ranks second all-time in school history for a single season. how does he compare to a guy like Nay? Any reason to think the round 5-10 picks won't all be college guys? I like all four of these picks. Given our low budget this year - I'm beginning to get worried we won't be able to sign them. I hope our scouts (and we have more than most teams) have insights into signability with these guys and we get at least 3 of these 4. If that's all we got that would not be a too bad haul. Jose Espada answers my question. Ryan Kellogg just was taken in the 5th round by Cubs. As Kiley from FG puts it, Estrada may be a "black swan". 5'11"/6' RHP's aren't scouting dreams, no matter the talent. Looks like more of the same (cost cutting) in round 6. But a switch hitting SS is always worth a look. Aside from the fact that the MLB draft tracker does not have scouting reports for some of the latest picks, is there any reason to suspect that these are cost-cutting selections? The preferred method for punting draft picks in order to save money to sign the guys you want to sign is to pick college seniors which the Jays haven't done yet. Not going to have any surplus pool money from the 1st 3 rounds, I'm guessing. Wise should get slot or close to it. Espada's a HS kid, can't see that being much underslot. Maybe Cardenas, but now were talking $258,000 slot - not big savings. Espada still looks like El Punto to me. AS MatO said, if you're going to punt, take college seniors, not a HS kid who could easily get a scholarship. My thoughts on Espada - Jays used their large scouting department to check this kid out more than most, and were willing to take a chance on a short righty (especially after Stroman's success) that most other teams wouldn't. Plus he should be signable around slot - maybe a bit more or a bit less.. I was going on a combination of history and the fact that mlb.com (or anyone else) had very little on the picks. I figured that AA had just got a little more creative and identified guys who would sign for under slot. I have to admit that it wasn't on a tremendous amount of evidence. agree with MatO. There have been no punts including Espada. No late round bonus this year. I also agree with a slightly pro college bias this year as the bottom tier of the farm system is awash with youth....and I expect a good month for international signings in July and many of them will be 16/17 in terms of age. well. sure looks like the scouts are gonna earn their money this year. or maybe not earn it. Round 3: John Olerud (no one expected him to sign), Jimmy Key, Shaun Marcum , David Weathers , Adam Lind , Chris Stynes , Greg Myers ... covers all 5+ WAR guys also over 0 WAR - Ron Romanick , Jake Marisnick, Felipe Crespo , Matt Ford, Jeff DeWillis ... guys who got a ML paycheque - Tyrell Godwin, Mike Romano , Clayton Andrews. 41 drafted, 15 reached, 2 superstars, 5 solid guys and a handful of 'meh'. Round 4: None over 10 WAR, Casey Janssen the only one over 3, Xavier Hernandez , Ryan Goins, Andre Robertson, Sam Dyson, Howard Battle all are positive WAR. ML paycheques for Tom Evans, Adam Peterson, Jeff Hearron and Brad Mills. Round 5: Stars: Dave Stieb, Pat Hentgen, Michael Young, Mike Timlin. Positive WAR Marc Rzepczynski , John Bale , Tom Davey, Justin James. Cups of coffee: Rickey Cradle, Mike Rouse, Mike Smith, and Tyler Pastornicky. Round 6: none over 4 WAR best is Pat Borders also Scott Livingstone, Jeff Musselman, Anthony DeSclafani, Sean Nolin, Jason Perry, Rich Thompson, Jose Silva and Stan Clarke. Round 7: Over 5 WAR: Casey Blake , plus Cris Carpenter, Robert Ray, Brian Milner, Anthony Sanders, Shawn Jeter, Eric Thames, Scott Brow, Carlton Loewer, Jeff Kaiser. Round 8: 5 guys with under 0.5 WAR each including Kendall Graveman. Round 9: Star: Jesse Barfield , nice ones: Glenallen Hill , Jeffrey Hammonds (DNS), Aaron Loup. plus 5 more who can say they are in Baseball Reference. Round 10: Ryan Freel, Yan Gomes , Josh Phelps are decent, 4 others who reached. So in 38 drafts round 4-10 have produced 5 stars, about 9 decent players and a batch of 'meh'. So 14 out of 266 picked who were worth the effort. Thus don't sweat it if the Jays pick a lot of 'meh' again as odds are no better than 1 in 3 that they find a solid player out of this part of the draft. there is info out there on Espada if u look for it. Bluebird Banter has a nice write up. Just think he was a late coming under the radar guy. Now pick #9 is a college senior and looks like a $$$ saver. Well, if Espada signs for 100k, you save a lot and if he doesn't sign you still keep the pick for next year, no? No, only 1st 3 rounds, plus you lose the pool money. Only picks 9 & 10 look like money savers. Really liking this draft again, every year I seem to love the haul AA comes up with. I'm looking forward to hearing from some of the Bauxites that follow college players on these picks? To my untrained eye, and many online commentators, we've got a steal in Harris and Singer and Maese seem to be good helium picks. cardenas and espada are off the radar, but perhaps this middle rounds are a good spot for to take a risk? how are people feeling about this draft so far? Picks that are JR are 3 years of College/University, while Seniors are 4 or possibly 5. J1 means one year of Community College/something similar and are not usually economy-saving picks. I can't see anyone needing big money's at this time. Something like slot or just under might be the norm. (Prices are subject to change due to supply and demand.) Tomorrow's picks may have bearing on what A.A. expects to spend. Have fun! Love the fact that instead of focusing on one or a few guys, they let teams picking earlier do that and grabbed the best signable guy that fell. Signable because they could have taken Cameron, but the odds of actually signing him would be next to zero even if they punted later picks. HS kids (including 1 popup/helium) with the 2 other protected picks, and trusting the scouts on picks 4-8. Seem to have punted with the 2 Canadian kids at 9 and 10, hopefully to save enough money for one overslot signing among the picks today. Seems to be excellent strategy considering only 6 teams have smaller bonus pools than the Jays this year. I think Tristan Pompey is draft eligible - Won't be surprised if the Jays call his name. Does anybody have more on Travis Bergen? Holding runners, fielding ability...etc. For a pitcher like him, these things can make all the difference. Jays nearing deal with 1st pick Harris for slot. Get the signings done early and often AA. Can't judge a draft until all the money is spent. Harris signed for slot. Singer will sign but might be haggling. So far nobody in the top 10 has received more than slot. Maese signed for $300K, less than half the slot amount and Espada signed for $15K under slot. There's a doubt about Daniel Young in the 8th, but he's already at University, why would he not sign? Overall the Jays have saved more than $600K, maybe Young and Signer take some of that, but I wouldn't be surprised if the Jays spend that money elsewhere. I agree Scottt. D young has to be signed or we lose the $ and pick. Singer is a protected pick. If he does sign with us we will see how he compares with the other HS pitchers we picked and signed. Not just this year but for 2014 & 3013. Both Singer and the Jays have to do what is in their own best interests.